In other words, it snows frozen smog on Pluto. picture of MU69 and any companion bodies. 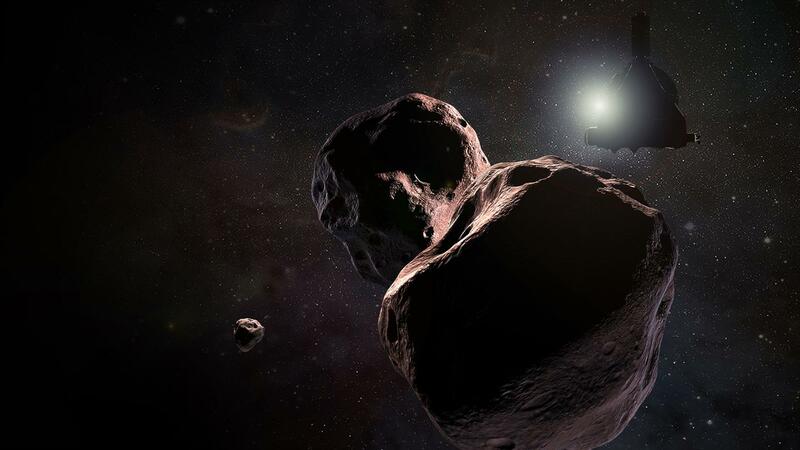 Scientists were already excited to learn this summer that New Horizons' next flyby target – a Kuiper Belt object a billion miles past Pluto – might be either peanut-shaped or even two objects orbiting one another. Now new data hints that 2014 MU69 might have company: a small moon. That's the latest theory coming from NASA's New Horizons team, as it continues to analyze telescope data on the target of a New Year's Day 2019 flyby. "We really won't know what MU69 looks like until we fly past it, or even gain a full understanding of it until after the encounter," said New Horizons science team member Marc Buie, of the Southwest Research Institute, Boulder, Colorado, who offered an update on the analysis of MU69 Monday at the American Geophysical Union Fall Meeting in New Orleans. "But even from afar, the more we examine it, the more interesting and amazing this little world becomes." <<15810 Arawn, provisional designation 1994 JR1, is a trans-Neptunian object (TNO) from the inner regions of the Kuiper belt, approximately 133 kilometres in diameter. It belongs to the plutinos, the largest class of resonant TNOs. It was named after Arawn, the ruler of the Celtic underworld, and discovered on 12 May 1994, by astronomers Michael Irwin and Anna Żytkow with the 2.5-metre Isaac Newton Telescope at La Palma Observatory in the Canary Islands, Spain. 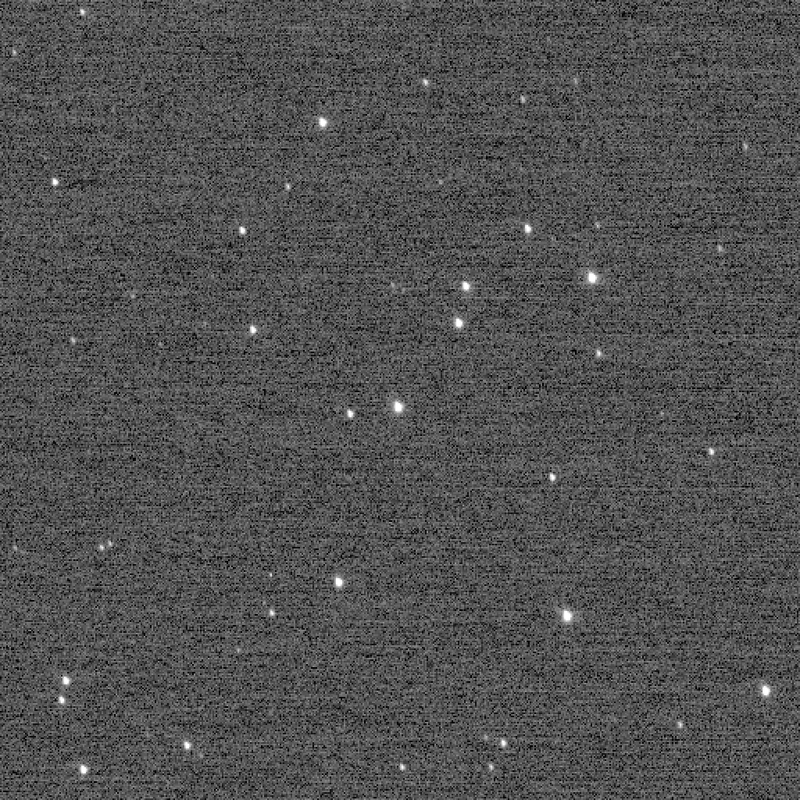 Arawn is unique in that it has been observed at a much closer distance than most Kuiper belt objects, by the New Horizons spacecraft, which imaged it a distance of 111 million km (0.74 AU) in April 2016; this and its other observations have allowed its [5.47 hour] rotation period to be determined. Arawn is moving in a relatively eccentric orbit entirely beyond the orbit of Neptune. With a semi-major axis of 39.4 AU, it orbits the Sun once every 247 years and 6 months. Its orbit has perihelion (closest approach to the Sun) of 34.7 AU, an aphelion (farthest distance from the Sun) of 44.1 AU, an eccentricity of 0.12 and an inclination of 4° with respect to the ecliptic. It is a plutino, being trapped in a 2:3 mean motion resonance with Neptune, similarly to dwarf planet Pluto, the largest known plutino. 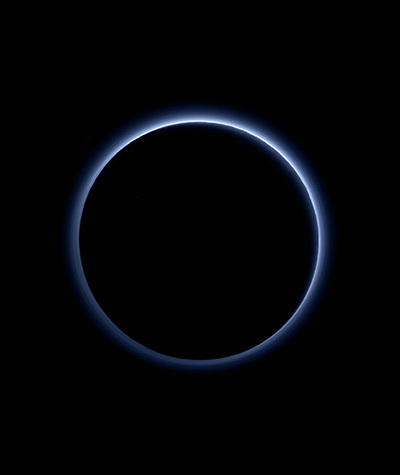 New Horizons to get closer to the KBO than it did to Pluto! Should get some good pictures on New Years 2019! Legendary explorers and visionaries, real and fictitious, are among those immortalized by the IAU in the first set of official surface-feature names for Pluto’s largest moon, Charon. The names were proposed by the New Horizons team and approved by IAU Working Group for Planetary System Nomenclature. Successfully observing an object from more than four billion miles away is difficult, yet NASA’s New Horizons mission team is banking that they can do that -- again. The image is an artist's concept, based on stellar occultation data. <<In 1948, Minneapolis, Minnesota postman William H. Schaper whittled a bug-like fishing lure he believed had toy potential, and sold it (and others like it) in his store as a sideline to his homebound business of manufacturing small commercial popcorn machines. 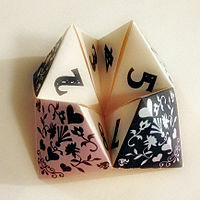 Eventually, he created a game around his creation, and, in 1949, molded it in plastic and formed the W. H. Schaper Mfg. Co. Inc.. 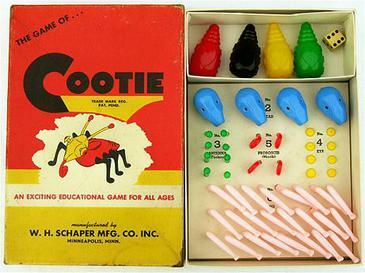 The Game of Cootie is a children's roll-and-move tabletop game for two to four players. The object is to be the first to build a three-dimensional bug-like object called a "cootie" from a variety of plastic body parts. The game was launched in 1949 and sold millions in its first years. it the farthest planetary object ever visited by a spacecraft. Every day; it's a getting closer! Before we realize it; it'll be over! hope we get some good Pics! With no apparent hazards in its way, NASA's New Horizons spacecraft has been given a "go" to stay on its optimal path to Ultima Thule as it speeds closer to a Jan. 1 flyby of the Kuiper Belt object a billion miles beyond Pluto – the farthest planetary flyby in history. After almost three weeks of sensitive searches for rings, small moons and other potential hazards around the object, New Horizons Principal Investigator Alan Stern gave the "all clear" for the spacecraft to remain on a path that takes it about 2,200 miles (3,500 kilometers) from Ultima, instead of a hazard-avoiding detour that would have pushed it three times farther out. With New Horizons blazing though space at some 31,500 miles (50,700 kilometers) per hour, a particle as small as a grain of rice could be lethal to the piano-sized probe. "The spacecraft is now targeted for the optimal flyby, over three times closer than we flew to Pluto," added Stern. "Ultima, here we come!" New Horizons will make its historic close approach to Ultima Thule at 12:33 a.m. EST on Jan. 1 — the first ever flyby of a Kuiper Belt object. NASA's New Horizons spacecraft is bearing down on Ultima Thule, its New Year's flyby target in the far away Kuiper Belt. 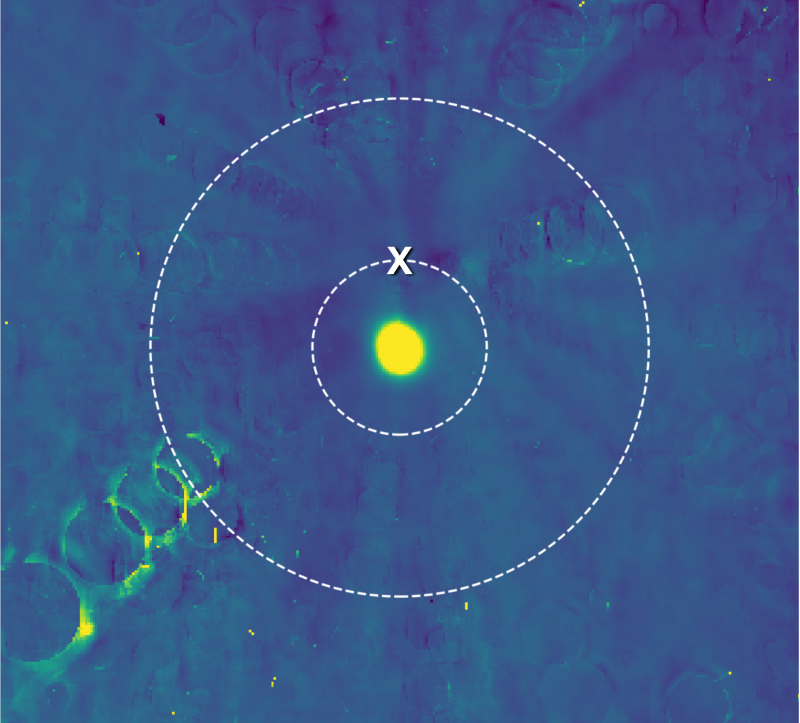 Among its approach observations over the past three months, the spacecraft has been taking hundreds of images to measure Ultima's brightness and how it varies as the object rotates. "It's possible that Ultima's rotation pole is aimed right at or close to the spacecraft," said Marc Buie, also of the Southwest Research Institute. That explanation is a natural, he said, but it requires the special circumstance of a particular orientation of Ultima. "Another explanation," said the SETI Institute's Mark Showalter, "is that Ultima may be surrounded by a cloud of dust that obscures its light curve, much the way a comet's coma often overwhelms the light reflected by its central nucleus." That explanation is plausible, Showalter added, but such a coma would require some source of heat to generate, and Ultima is too far away for the Sun's feeble light to do the trick. 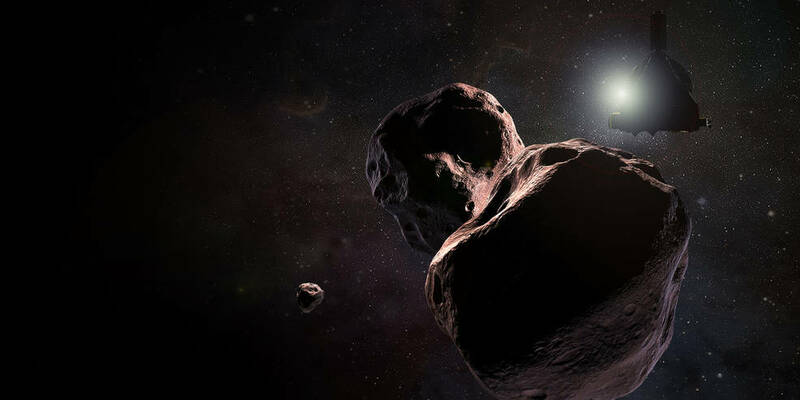 "An even more bizarre scenario is one in which Ultima is surrounded by many tiny tumbling moons," said University of Virginia's Anne Verbiscer, a New Horizons assistant project scientist. "If each moon has its own light curve, then together they could create a jumbled superposition of light curves that make it look to New Horizons like Ultima has a small light curve." While that explanation is also plausible, she adds, it has no parallel in all the other bodies of our solar system. "It's hard to say which of these ideas is right," Stern said. "Perhaps its even something we haven't even thought of. In any case, we'll get to the bottom of this puzzle soon – New Horizons will swoop over Ultima and take high-resolution images on Dec. 31 and Jan. 1, and the first of those images will be available on Earth just a day later. When we see those high--resolution images, we'll know the answer to Ultima's vexing, first puzzle. Stay tuned!" How about an even simpler answer. Hum. Then allow me to refine my theory. Ultima Thule's rotation rate and spin orientation are such that, as viewed from New Horizons' approach, it has been mostly showing us only one side. It is a very slow rotator. Now that NH is rapidly closing on UT the signal from any minor surface feature albedo difference is being swamped by the rapid brightness increase due to the distance change. So my guess, (soon to be confirmed or refuted) is that it is a slow rotator with a low level of albedo contrast. If >> massive objects (Uranus, Venus) can have their initially prograde rotations reversed due to impact or tidal interactions then I see no reason why a member of the Kuiper belt can't have a nearly nil rotation rate. Then allow me to refine my theory. 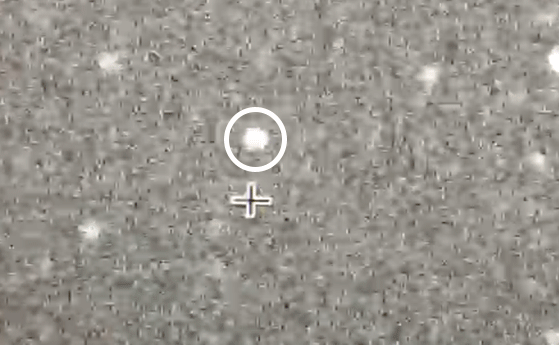 Ultima Thule's rotation rate and spin orientation are such that, as viewed from New Horizons' approach, it has been mostly showing us only one side. It is a very slow rotator. Now that NH is rapidly closing on UT the signal from any minor surface feature albedo difference is being swamped by the rapid brightness increase due to the distance change. So my guess, (soon to be confirmed or refuted) is that it is a slow rotator with a low level of albedo contrast. I suppose one could envision Ultima Thule being tidal locked to a dark moon of orbital period over 7 days that has yet to be detected. <<The dwarf planet 2007 OR10 is an enigma wrapped in a mystery: with a long orbit taking it out to a distant aphelion 101 astronomical units (AU) from the Sun, back into the environs of Neptune and Pluto for a perihelion 33 AU from the Sun once every 549 years, 2007 OR10 was discovered by Caltech astronomers Megan Schwamb and Mike Brown in 2007. Nicknamed “Snow White” by Mike Brown for its presumed high albedo, 2007 OR10 was 85 AU distant in the constellation Aquarius at the time of discovery and outbound towards aphelion in 2135. 2007 OR10 is about 1,500 kilometers in diameter, the third largest body known beyond Neptune in our solar system next to Pluto and Eris (nee Xena). A very special encounter is set to take place in the Kuiper Belt, six and a half billion kilometres from Earth, right at the beginning of the New Year. NASA’s New Horizons spacecraft will visit object 2014 MU69, better known as Ultima Thule. At 06:33 CET, New Horizons will fly past Ultima Thule and use its measuring equipment to examine the object from a distance of just 3500 kilometres. New Horizons was launched to space approximately 13 years ago to investigate the dwarf planet Pluto. 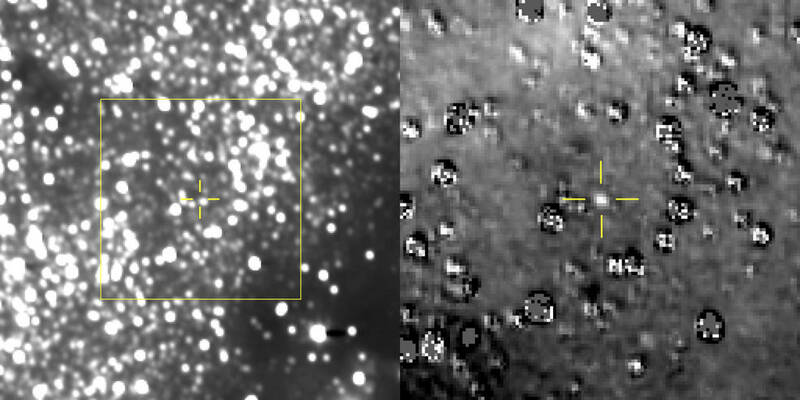 This is the first close-up exploration of a body beyond Pluto.